New contributor, Lindsay Goyette goes behind the scenes at Astoria Coffee, where she divulges new plans for the quirky coffee house. We have a special weekend treat for you Astoria, as we’d like to introduce our newest We Heart Astoria contributor, Lindsay Goyette. Meeting Lindsay a few months ago during our We Heart Cream Cheese Brooklyn Bagel promotion, Lindsay suggested the winning cream cheese flavor, PUB. 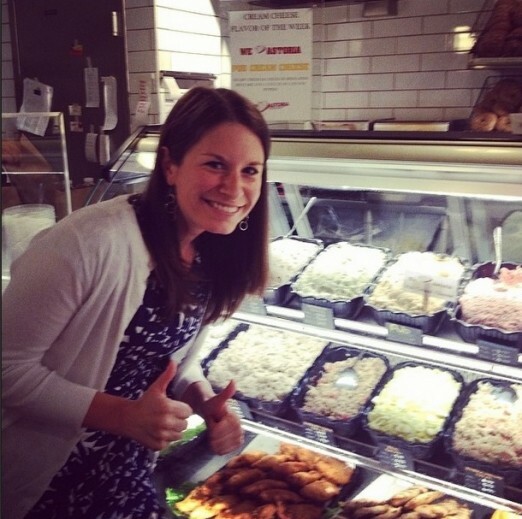 But aside from being a bagel and cream cheese fan, Lindsay is an avid Astorian who can’t imagine living anywhere else. A lover of arts and culture, and also healthy food, Lindsay will bring you weekly coverage of Astorian happs in her own unique style. We look forward to our collaboration and to hearing what you think. 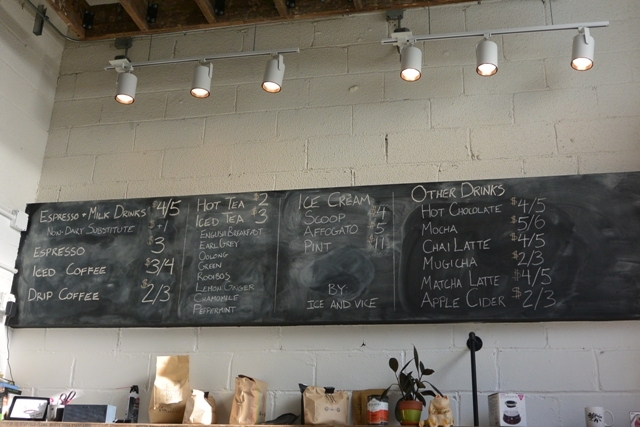 And now without further ado, here’s Lindsay’s first post which shines a light on Astoria Coffee. Enjoy! Entering Astoria Coffee is instantly comforting: the baristas are welcoming, the baked goods are enticing, and the drink menu is full of hot, soothing goodness. About six months after opening, this charming spot, located on 30th Ave and 30th Street, is emerging as a versatile place to pop in for coffee, tea, baked goods, and special events. I stopped in this morning for a peppermint tea and a chocolate croissant, and spent some time chatting with owner Dennis Lee. 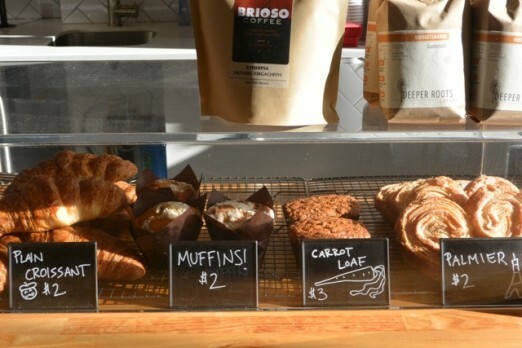 Lucky for Astorians, this cafe is just getting started! In addition to their current menu, Dennis hopes to begin introducing savory items, such as soups and sandwiches. They have also received a liquor license, with plans to eventually expand their hours and serve beer and wine. Special events are also a focal point of Dennis’s vision. 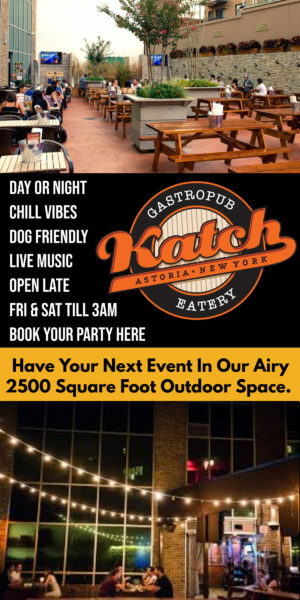 Astoria Coffee has already hosted comedy shows and Meetup groups, and is planning on bringing in local musicians for low-key performances. They recently held a successful (and quirky!) event: their first Drunk Vocab Bee, a collaboration with Astoria Bookshop, another neighborhood newcomer. They are looking forward to many more neighborhood mash-up events in the future! Astoria Coffee is also becoming a social media powerhouse. Their Instagram account boasts over 1,200 followers, and features the popular daily #DuelingTipJar, which pits tip jars with separate pictures on them against each other in a battle for each customer’s cash. 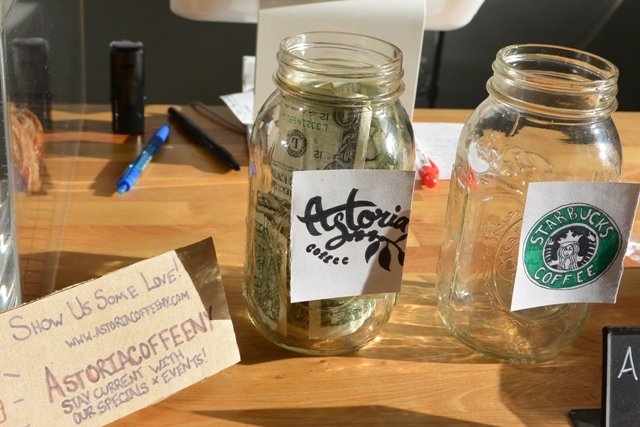 Today’s cheeky competition had Astoria Coffee facing off against java behemoth Starbucks. Becoming a contributing member of the Astoria small business community is important to Dennis. In the six months they’ve been open, he has found the local folks welcoming and helpful, and is eager for feedback from business owners and visitors alike. 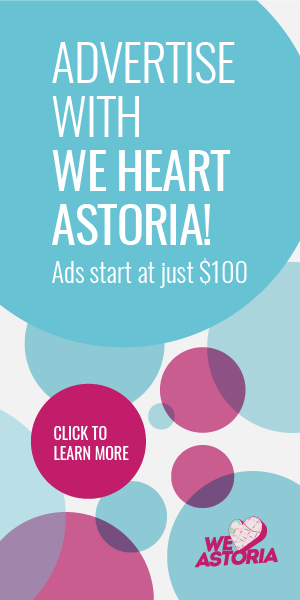 Whether it’s ideas for new menu items or out-of-the-box events, Astoria Coffee wants to hear from US about how to make the most out of the community coffee shop. Have you stopped in Astoria Coffee yet? Tell us in the comments about your caffeine fix experience! 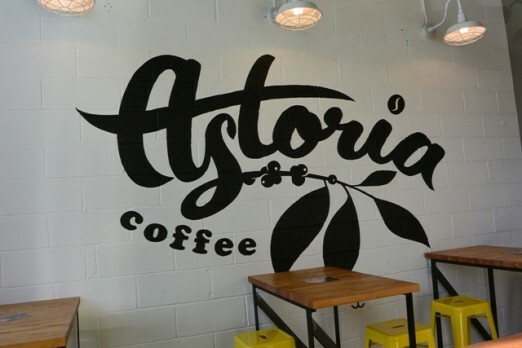 Astoria Coffee – 30-04 30th St, Astoria. 347.410.7399. Facebook. Twitter. Instagram. Why do I keep missing this coffee shop? I pass by this block at least once a week. Sigh It’s just tucked behind that loathing Verizon store. Wish you guys took over the Verizon store. We love Ice and Vice too – can’t wait to try the affogato! Dennis is such a nice guy! Coffee is amazing! I especially recommend the pour over as Dennis is an artist when it comes to coffee, and it is well worth the wait. In addition, they have unbelievably delicious ice cream from Ice and Vice in which they make affogatos with, which is a perfect treat for all coffee and ice cream lovers! Great article – I wasn’t aware they have “drunk vocab bee’s”….I have to check that out!